Catching up! Time flies when you’re having fun. Wow! Too much time has passed since I was last able to blog. November and December were full of much excitement including a very festive wine club. My Chix Who Wine group always bring the spouses along in December so it was a lively group of eighteen. That posed some challenges with this group when it came to presenting the wines. Let’s face it, when you get 18 rather extroverted people together and include wine, it will get noisy. I made very detailed booklets for everyone with all my research notes and maps. Instead of having everyone sit down to a formal tasting they mingled and I moved through the room, one wine at a time and simply introduced the wine as I poured out the tastes. It worked really well! Each wine was enjoyed along with a wonderful selection of food brought by the group. I had a break in between wines so if anyone wanted to talk in more detail there was time for a more personal chat. By the time we got through all of the wines there was enough left, as I’d brought two bottles of each, for the party to continue revisiting their favourites or re-trying with various foods. What I thought might be overwhelming went extremely smoothly. I wanted to do wines to pair with Christmas dinner which of course can vary from turkey to prime rib and just about everything in between. Each person had brought dishes that covered the gamut of flavours for the more traditional feasts. We started with a Zardetto Prosecco as there’s really nothing like bubble to kick off a celebratory mood. It’s delicious, affordable, family owned and versatile when it comes to food pairings. Next up was Gosset Champagne. You can’t really have a special occasion wine tasting without serving Champagne if you ask me. My budget allowed for the entry level Brut Excellence from this oldest wine house in Champagne. Moving on to still wines we started with Trimbach Pinot Gris Reserve. This winery is known for its family history, pedigree and dry Alsatian wines. I followed this with the Zind-Humbrecht Gewürztraminer, also from Alsace with an amazing reputation for quality. The Delaporte Sancerre Rouge from a magnum was the perfect transition into reds and this Pinot Noir was showing beautifully. I always love how people go wild for magnums. If you’re having a dinner party and are planning on getting two bottles of a wine, see if it’s available in a larger format. There’s something undeniably impressive about pouring from a big bottle. The Faiveley Moulin-a-Vent was a good segueway into the big bold realm of the Austin Hope Troublemaker. I can tell you that many a man likes to consider himself just that – a Troublemaker. This red blend from Paso Robles was a hit! Of course, Christmas and Port are meant for each other. At least they were when I was growing up! I needed a good value Port and chose the Dow’s LBV Port. A colleague gifted me the Grant Burge Aged Tawny as well. What a treat! Everything showed incredibly well and I caught myself off-guard as I commented that I should check what the biodynamic calendar had to say. As soon as the words were uttered I remembered that I’d chosen the dates for October’s tasting and December’s well ahead of time, based on the biodynamic tasting calendar. I know there are many who may guffaw at this ‘hocus pocus’. I understand that it may be too much for some to swallow but the more I test out this theory, the more I believe. Sure, it may simply be that all of the wines that I chose were solid choices. They were. The reality is that even with a smaller group, I find it rare that every wine will be a hit with the majority, or in this case – all. Anyway, in my attempt to always offer the best experiences to my wine clubs I’m going to hedge my bets and try to pick dates for optimal tasting. I’ll let you know how my theory holds up. Wow! It’s been a while since I’ve had time to write up a new post. The business of wine gets particularly busy at this time of year for a lot of us. On top of my fantastic regular job I also had to prep for a couple of wine clubs this month. Pair that with it prepping for my favourite celebration of the year, Halloween, and I’ve had my hands full! I was so excited when Crystal Henrickson, the Marketing Director for Yelp Canada, asked me if I’d put together a wine pairing event for all the Yelp Canada Community Managers. The event was held at Rachel Sawatzky’s Cocoa Nymph. La Taqueria was coming to0 so I was pairing with tacos and chocolate. My budget was tight but I wanted to make it impressive so I picked wines that I knew would deliver super quality for the price point. I’ve always been a fan of the Pares Balta Cava Brut and had served it at my own wedding years ago. For $20 at the BCLDB this organic bubble from Spain is always a crowd favourite and it feels good to support such a lovely family whose history at the winery dates back to 1790. I decided to use this as a reception wine to help stimulate appetites. It was a hit and the CM from Toronto told me she’d also used it at her wedding and had a case of it at home. Deciding what to pair with tacos was a challenge, especially as I didn’t have the luxury of trying the foods prior to choosing. I admit to usually going with beer when it comes to Mexican food and off-dry Rieslings with spicy Asian food. I really wanted to pour a red wine though so knew it had to be something juicy, light on tannins with enough flavour to stand up to some bold taco ingredients. As the chef from La Taqueria demonstrated how to make a good Mole sauce I got a bit nervous. I kept the group topped up with Cava and watched as the chef added various chili peppers. Holy Mole!! Luckily there were four different flavours of tacos and although the group said the Matchbook 2009 Syrah went well with all of them. I especially liked it with the vegetarian taco but it did actually work well with all of them, even the Mole one. I know that this wine is one that would normally retail for more than its $18 price tag at the BCLDB as the winery is passing on a good deal to secure this listing. The packaging has an interesting story behind it which is always something I enjoy sharing with people. After the delicious meal of tacos the group moved to the back of Cocoa Nymph for their chance to make scrumptious truffle chocolates. Rachel led them through the process and it was fun to watch their creativity flow. If you have a chance to get a group together making chocolates at Cocoa Nymph is a great way to have fun, learn something and take home a sweet box of your hand-created treats. Once the chocolates were in the fridge to cool the group went back to the shop front where Rachel had picked out a lovely chocolate, her unique version of a Turtle, to pair with the Gonzalez Byass Nutty Solera Oloroso that I’d picked to finish off the evening. I wanted to do something fortified and decided that this would be a great opportunity to talk about Sherry as that’s often a topic a lot of people aren’t familiar with. I don’t think anyone would have guessed that this is only $18 at the BCLDB. It was a match made in heaven. If you’re new to the wining and dining aspect of your job and your wine knowledge is fairly limited, then ordering wine for your lucrative clients at a business dinner could be rather intimidating. We all want to look like we have some knowledge when the decision on ordering wine is in our hands. You want to consider your guests’ tastes, the food that is being ordered and the budget. If the sky is the limit on budget it can be even more intimidating as you still want to make a good impression and wasting money is never viewed as strong business acumen. My suggestion is to get a group of your colleagues together and hire someone like me to help you out. You need some wine knowledge to remove the intimidation factor from ordering wine. You want to know what wine smells like when it’s ‘corked’. You need to have some basic understanding of pairing wine with food. It’s good to learn the language of wine so that you can ask the sommelier for guidance in a knowledgeable way. A lot of people stick with ordering the same wines all the time because they can pronounce the name. A word like Trockenbeerenauslese can roll off the tongue once you’ve heard it said out loud. Knowing that most wine geeks refer to it as TBA is also handy. There are some wines regions that don’t name the grape in the wine because they all know what it is. You’ll know too, once someone has told you. Being told that Champagne is in order is always a good sign but ordering Henkell Trocken (hey, it has bubbles right?) is probably going to raise an eyebrow or two. The one main theme that I want to bring to the table is that wine doesn’t have to be intimidating. I want to foster an atmosphere of open discussion that is comfortable for even the newest of wine neophytes. It would be so satisfying to walk a group of business people through the basics of ordering wine then send them off to a restaurant together with wine knowledge fresh in their minds, keen to put their new skills to the test. This sounds like a great idea for a company team event! Contact me at bytheglasswineclub@gmail.com to arrange wine training for your next team meeting. 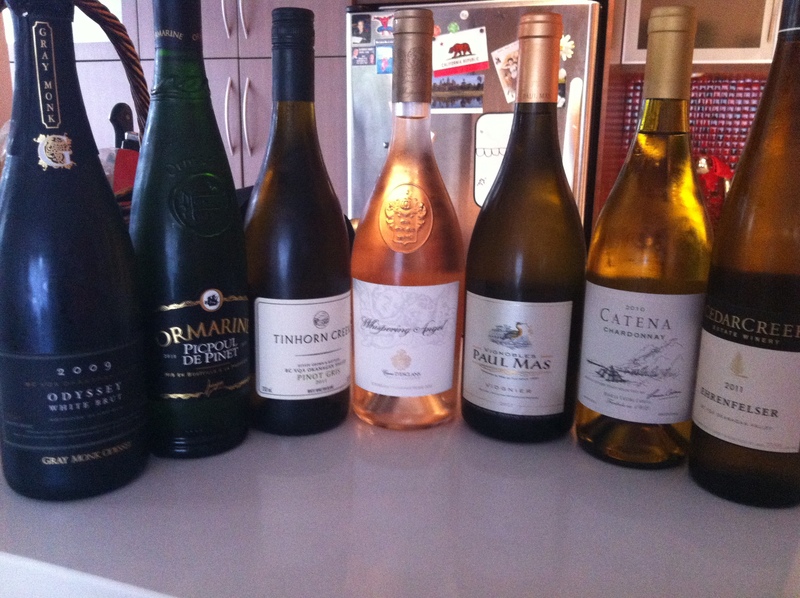 I had a wine budget of $140 and wanted to present some wines that likely the wine club hadn’t tried before. I also wanted a good cross-section from sparkling wine to rosé, lively to lush. As we tasted through the line-up I was really pleased to hear the group ask how I’d managed to get these wines with our budget. There wasn’t a dud in the bunch. I always hold back on the price until after we’ve tried all the wines. I want opinions to be based solely on the taste impressions. In fact I’m going to go back to my former decision to serve the wines blind so that they can’t even see the label first. Once everyone has tried the wine I will reveal and talk about the winery and any viti/viniculture information that’s of interest. I’ll let you know how that goes next time. I was really impressed with the Ormarine Picpoul de Pinet for $13 and for $22 the Catena Chardonnay definitely offers a level of quality that surpasses its price. When one member found out the price of the Paul Mas Viognier she exclaimed “I’m going to buy like 800 cases!” An exaggeration of course, but at $14 she can definitely get a case or two. I’m not going to detail the notes and feedback on all the wines because that’s the beauty of being part of wine club! We each had our favourites and ones we’d buy again. Not everyone loved every wine but this selection definitely hit plenty of positive notes with the group. From bubble to Rosé – a selection of crisp to luscious wines. Learning about wine: my recent research discoveries. My favourite part of prepping for a wine club is researching the wines I’ve selected. I love learning about viticulture and viniculture. Some of the things I’ve discovered will be common knowledge to many wine enthusiasts. I was happy to find out that one of the most knowledgeable people I work with didn’t know about the translation of picpoul. I’m not embarrassed to admit what I don’t know and neither should you be. I’d like to share my new knowledge and will keep posting as I learn. I have yet to take advantage of this option myself. A few of us from the office did ask at our favourite Chinese noodle house. They hadn’t heard of the new policy but were going to find out. As we ate we discussed which wines we’d pair with which dishes if given the chance. We’ll all have to take turns picking a bottle to take, that is if the restaurant agrees to participate. I hope they do as I frequent with some great guys who really love to geek out over wine. Someone else I work with took a bottle to Milestones. $19 corkage – they graciously took the wine from him and served it as though it was off their list. The server wasn’t allowed to try any when offered which is a shame. Personally I’d offer to leave some from them to try when they do their cash out. That’s if they were allowed at least that. Many people in BC, including me, were excited to hear that it’s now legal to bring your own bottle of wine (BYOW) to a restaurant here. Suddenly though, there was a rash of ranting on social media regarding corkage fees. It seems that many people expect corkage fees to be $5 and don’t really comprehend the reasons they may be higher. My guess is that most of them have no idea of the costs involved in running a restaurant. Someone has to serve you, supply glassware, wash glassware, replace broken glassware…well, you get the point. Restaurants are a business and the goal of business is to make money and ideally show a profit when all is said and done. This week comments have simmered down and I’m curious how many people have already started taking advantage of this option. I went out on Friday night to an Indian restaurant, typically the kind of place that a wine list may be lacking. I was happy to discover a decent bottle of BC Gewurztraminer at an affordable price. Hardly would have been worth my while to take in my own bottle. When would I take advantage of BYOW? 1) If I was going somewhere that I knew had a really pedestrian list. 2) If the restaurant was known for its outrageous mark-ups. 3) If I know the sommelier and had something really special I wanted to share with them. 4) If I know the sommelier and want them to try a wine I work with. 5) If I was going with a group and everyone else was taking wine. 6) If I was taking a winemaker and they wanted to show their wines to the dinner party or the sommelier. Mostly if I’m going out to a good restaurant I want to learn something new, taste something new and enjoy getting suggestions from their sommelier. If I only ever took wines that I knew life would get kind of boring. Perhaps I’m not a typical consumer though as I actually cook dinner most nights of the week. Going out for dinner is about an experience and if I’m going to one of the wonderful restaurants we have in the gorgeous city perusing their wine list is part of that experience. On facebook and yelp I posted some basic tips on corkage etiquette. There are a few reasons that I think restaurants should embrace corkage. Most of these apply to smaller venues though, as they don’t have the same capital as the big guns. 2) You can focus on keeping a tight list together of great value wines with a few treats for those guests that don’t want to BYOW. 3) Hopefully you’ll get the chance to try more wines. 4) If someone’s wine is faulty/corked you won’t have to deal with the hassle of returning the bottle to the BCLDB. Section 42 of the Liquor Control and Licensing Regulation has been amended. • Food Primary licensees may allow customers to bring their own bottle of wine into licensed restaurants. • Participation is up to the individual licensee. Licensees are not compelled to allow a customer to bring their own wine. • Licensees are not required to seek approval or provide notice to the Liquor Control and Licensing Branch that they are participating. • The wine must be unopened and commercially produced. No UVin or home made products are permitted. • Customers must hand the bottle to the licensee or staff person as soon as they enter the restaurant. • The wine is served in the same manner as wine selected from the menu. The licensee may set a corkage fee for this service. • Customers may take away unfinished bottles of wine. Your staff must put a new cork in the bottle and tell customers who are driving that they must store the wine behind the rear seat, in the trunk, or in an exterior compartment – it must be out of reach of people in the car. • Unfinished bottles of wine may not be added to the licensee’s inventory. • Licensees are still bound by responsible service requirements and must not over serve patrons or serve intoxicated patrons. To the people complaining about $20+ corkage fees I’d like you to consider that you don’t have to take your own bottle, you can still order off the list. Also, if you’re taking anything that’s $20+ retail it is almost guaranteed to be a deal. I don’t know of many restaurants that don’t at least double the retail price of wine to get their list price. I really hope everyone from consumers to restaurants will embrace the opportunities that change brings. Most of us have been pretty vocal about the strict liquor laws here so let’s now celebrate a step in the right direction! Excuse me waiter, there’s a fly in my wine.